Despite the controversies around the name Lai Mohammed, he still remains one of the most important people in Nigeria. His political career in Nigeria has started for a long time now and he is still faring well in politics. 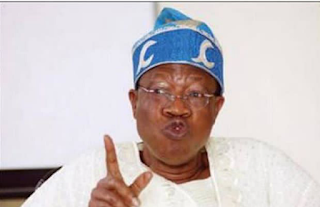 This article is aimed at giving relevant information about Lai mohammed to get to know more about him. Lai Mohammed was born in the year 1952 (age 66) to the family of Alhaji Adekeye Mohammed in Kwara State, Nigeria. There is no current information about his primary school and secondary school education, but we know that he studied French Language at the Obafemi Awolowo University, Ife where he obtained a bachelors degree in the year 1975. In 1986, he also got admitted into the University of Lagos where he got a law degree and also furthered his law education at the Nigerian Law School. He became so buoyant in Law that in 1989 he co-founded Edu and Mohammed legal firm and is currently a senior partner of the firm. He was the chairman of Optmedia Ltd, founded on the 18th of December, 2008 which is a subsidiary of the Afromedia Plc. He was the director of Afromedia Plc. He is a fellow of the NIPR (which stands for the Nigerian Institute of Public Relations). He was a Public Relation Officer (P.R.O) with the Nigerian Airport Authority (currently known as FAAN) for about 10 years. In 2002, he contested for the governorship position in Kwara State, that period he face some assault as five of his convoy vehicles were destroyed in front of Senator Agadi Suleiman’s office at Oke Onigbin, Kwara State. He has served as the chief of Staff during the Governor Bola Tinubu’s tenure (ex Governor of Lagos State). He is the National Publicity Chairman of the All Progressive Congress Political Party (APC). He is the current minister of Information & culture, sworn in on the 11th of November, 2015, following the swearing in of President Muhammadu Buhari.